Patented SHOK Plates diffuse pressure points and jarring forces by spreading impact across a wider area. SHOKBLOX connected grid acts as a second set of tendons and ligaments to aid in reducing over strain. SHOKBLOX impact grids deflect initial impact then subtly flex via strong micro-hinges to absorb residual force. Only SHOKBLOX offers both deflection and absorption in every step. The challenge in footwear design has been achieving the perfect combination of cushioning, flexibility, and a low profile, with genuine protection from impacting forces. Material limitations create this dilemma for footwear designers, which are often forced to make compromises. SHOKBLOX impact grids were created by athletes. We understand that impact and pressure points differ with each sport. 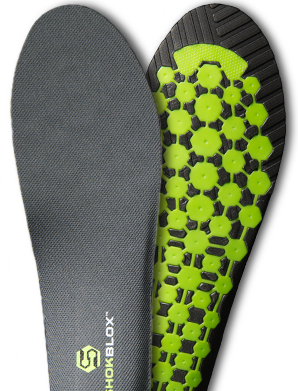 We understand that each athlete’s shoes are made to fit and perform differently, which require different insoles. As such, SHOKBLOX offers performance impact grids that work perfectly with your shoes.